History of ApiHealth NZ Ltd starts from former company Scientific Technology and Ecology Ltd., which was founded in January 1998 and at the end of that year became a Winner of Bank of New Zealand Waitakere Eco City Business Awards in two categories: "Best New Business" and "Innovative Business". ApiHealth is a progressive company with an ever-expanding global export market through the production of specialized products and is a leading supplier of quality natural bee venom products. 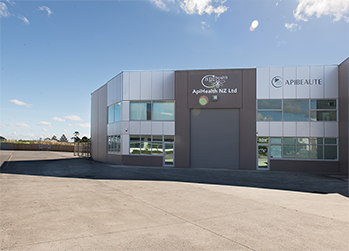 ApiHealth NZ Ltd specialize in the development and manufacturing new bee health and skin care products for human consumption and veterinary with use of innovative technologies. There is large range of bee health products: honey based products, creams, extracts, tinctures and tablets which have beneficial properties for different health conditions. ApiHealth produce a wide range of New Zealand bee health products: Bee Venom products, Propolis products, Bee Pollen products, NZ Royal Jelly products, Manuka honeys with Unique Manuka Factor - UMF®, Deer Velvet products, Skin Care products and Products for Pets Health. Products made with the use of ApiHealth technologies have unique properties and are becoming more and more popular all over the world. Today you can find our products in many countries (USA, Canada, UK, Austria, Italy, The Netherland, Middle East, Hong-Kong, Singapore, China and others). Directors of ApiHealth NZ Ltd are Dr. Nikolai Nikolaev and Dr. Tatiana Nikolaeva. They have many years of experience in Scientific Research & Development in biological science. Besides, Dr. Nikolai Nikolaev has experience in beekeeping. He patented a modernized technology of bee venom collection both in Russian and New Zealand (NZ patent #329585). This technology allows collecting super grade bee venom in a commercial scale without harming the bees. At present ApiHealth NZ Ltd is a main commercial supplier of high quality bee venom in New Zealand. ApiHealth bee venom collected in green, clean and nuclear free country has a unique beneficial effect and can be used not only in medicines, but also in a range of health products such as food products. Those unique qualities, combined with a sensible method of venom collection, are characteristics for VENZ™ (Venom of New Zealand), in comparison with bee venom of any other origin (NZ Trade Mark # 295559). Dr. Nikolaev was the first in New Zealand to suggest utilizing natural dry bee venom powder for making honey-based products and later developed the technology of mixing both liquid and dry honey with dry bee venom. The safe and healthy dosage of bee venom in the products was scientifically substantiated. This technology was recognized as innovative (NZ patent #333790). The main advantage of this technology is the possibility of standardization of bee venom dosage in the final product. The products made under ApiHealth technology have had a lot of references that state remarkable beneficial results. The latest ApiHealth developments in manufacturing bee venom skin care products became popular around the world. As a result we see now new era for bee venom in skin care products due to its unique properties of polypeptides and enzymes complex which allow providing regeneration of new skin cells and provide anti-aging effect. We hope that bee venom will be accepted as a new great ingredient. Today ApiHealth employs highly qualified staff and co-operates widely with the international scientists which allows to progress in manufacturing techniques and develop innovative technological approaches in making unique health bee products. Only rational scientific and technological processing and using of bee products and health products can preserve all biological activity of the main components and as a result their healing properties.